Mixed Paella with chicken, seafood and chorizo. 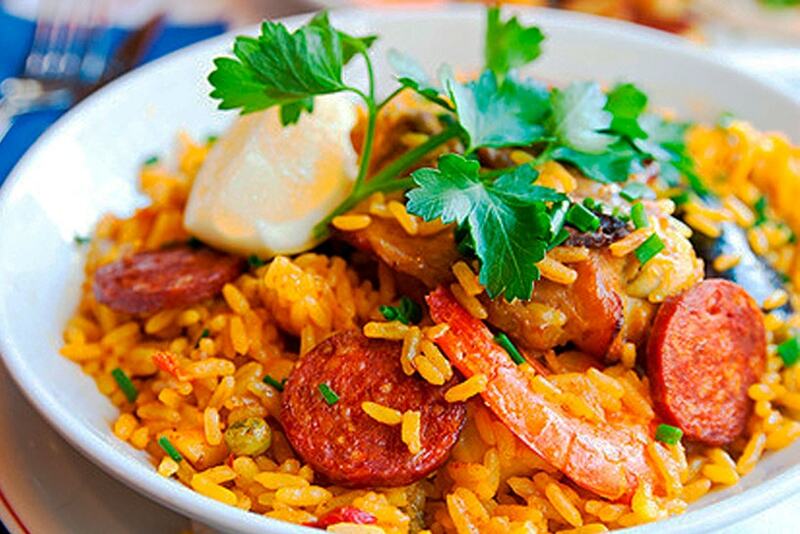 Meat and Seafood Paella or mixed Paella, as its name indicates, is a mixture of rice, seafood, and meat, as well as a mixture of vegetables to make the delicious sofrito. For me, the socarrat is the best part. That crunchy burnt rice crust is incredible. But in order for it to form, a metal paella is essential, it won’t come out if we do it in a non-stick frying pan. Rice is just as important as the tools. It should be made with medium-grain and round paella rice. Its shape is ideal for absorbing large amounts of liquid, something that does not happen with long grain rice or basmati rice. For the most traditional seafood paella recipe go to our home page! 1 First, in a small bowl put the saffron in 50 ml of hot water, and let it rest for 15 minutes. 2 Then season the chicken and prawns with salt and black pepper. 3 Next heat the oil in a paella or frying pan that is about 40 cm in diameter over medium-high heat. When hot, add the chicken pieces, the chorizo in slices and the prawns and let them fry until they are golden brown, stirring from time to time so that they are evenly cooked. 4 Once the prawns are golden brown, take them to a separate plate. 5 Next add the paprika, garlic, tomatoes, and onion to the paella and fry, stirring frequently, until the onion is tender. 6 At this moment is when we add the mixture of saffron and chicken broth, season with salt and increase the temperature. 7 Now add the rice and stir it with a spoon so that it is evenly distributed. Also, add the capsicum and continue cooking (without stirring), until the rice has absorbed most of the liquid, about 12-15 minutes. 8 Next, turn the heat to low and add the prawns along with the washed clams. 9 Leave it for 5-10 minutes until the clams open and the liquid is completely absorbed. 10 At the last minute, put it on high heat to create the socarrat (what sticks to the bottom of the paella). 11 To finish, turn off the heat and cover the paella with aluminum foil to rest for a few minutes. So if you like Seafood, chicken, and chorizo, this Mixed Paella is the perfect one for you! Enjoy this Seafood and Meat Paella with some wine for lunch or dinner and feel like you were in Spain!